We know how helpless you can feel when you don’t know why your baby’s crying. One reason your little one may be upset is due to an imbalance of good and non-beneficial bacteria causing occasional digestive upset, fussiness, and crying. 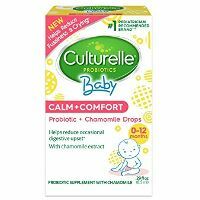 That’s why we’ve developed Culturelle Baby Calm + Comfort, with ingredients to help you soothe your baby.